Iran has finally overcome its two big predicaments with the international community in terms of human rights, though in the Islamic Republic’s style. Recently, Iran’s Judiciary spokesman announced that stoning no longer exists in the new penal code. A few days later, a Member of Parliament announced that ‘the execution of juveniles has been omitted in the new Islamic penal code’. However those of us familiar with the complex working and implementation of the Iranian legal system who have studied the “revised” code in detail have to say while on the surface both of these claims may appear correct; in reality they are false. There is a nuance that has been lost in western media reports that have heralded these announcements as a victory and major advancement for human rights in Iran (see Financial Times and The Telegraph). Alas, in reality, Raha Bahraini has amply demonstrated the falseness of this claim as it relates to the execution of juveniles,through her legal analysis of the Islamic judiciary system. The cosmetic changes to the new legal code only indicate that the Islamic Republic of Iran has given into international pressure by burying their problematic actions into the complexity of their legal justice system. They do not represent a genuine change of heart about the practice or implementation of stoning. In comparison to the previous penal code, stoning has been removed from the section of the code dealing with penalties for different forms of ‘adultery’. However, adultery remains a crime in the new code, though now the punishment is to be decided by the Supreme Leader. Furthermore, the word ‘stoning’ appears twice in other articles of the new penal code, although details about its implementation, such as the appropriate size of stones to be used, wrapping the convicted person in a white shroud (kafan) and burying the male adulterer in the soil up his waist and a female up to her shoulders, are all gone. But the omission of the implementation process is hardly reason to celebrate ‘the end’ of the practice. According to Article 172, denial after confession will not be accepted except for those crimes which have brought either an execution or stoning sentence. Article 198 remains on the books, articulating the number of witness statements (that of at least four males, or three males plus two females) which have to be secured in order to issue a stoning sentence. We have to ask, if stoning as execution for adultery ‘no longer exists’, then why have the aforementioned articles not removed the idea of execution by stoning in the new penal code? The fact is, as long as adultery is a crime, judges are expected to hand down sentences to defendants accused of committing adultery. But since the punishment for adultery is no longer explicitly outlined in the new penal code, according to Article 221 judges are obliged to ask the Supreme Leader to issue a religious order (fatwa) in such cases. This means that Ayatollah Khamenei, Iran’s Supreme Leader, who has never issued a fatwa, neither about the punishment for adultery nor about any other criminal matters, is expected to decide on these cases. While an Iranian Member of Parliament (Majles) has recently said that the Supreme Leader will seek an alternative punishment for adultery (you need either the ref or the name of the MP here), this is no easy task. The Supreme Leader may have a vast political power, but often has insufficient religious power and credibility to issue such fatwa, since there are many religious leaders who are senior to him. What makes the case more complex is the existence of a consensus amongst Shi’a jurists (maraaje) that the proper punishment for adultery is only stoning, and nothing else will suffice. According to the same strict judicial rules, the judge is not allowed to alter this punishment. Therefore, if Iran’s Supreme Leader issues a different punishment for adultery, it will likely be considered invalid by many religious leaders, even if it is execution by hanging or another less inhuman form of execution. 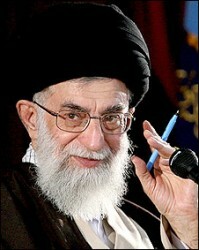 The question is whether Ayatollah Khamenei would be willing to bear the consequences of such a revolutionary fatwa!! We should also look at the process by which this new bill came about. When the first draft of the new penal code was written, it contained the option that the judge himself could change the sentence from stoning to hanging, if he felt that the implementation of stoning may harm the image and honour of the Islamic Republic of Iran. However orthodox religious leaders exerted considerable pressure, and successfully removed that clause from the draft bill. Consequently, the parliament then opted for an alternative solution, omitting the word ‘stoning’ in the Article dealing with punishment for adultery, and leaving it to be solved by the Supreme Leader. However, even if the Supreme Leader is ready to challenge Shi’a jurists, he still has deal with the existing problem of Articles 172 and 198 accepting stoning as a possible sentence for adultery in the new penal code. At most what we have to celebrate as human rights activists is the prediction that Ayatollah Khamenei will brave it out, and despite the pressure from conservative religious leaders issue a fatwa which could replace stoning with execution by other means, in order to get rid of the international pressure that has amounted in recent years, particularly due to the high profile case of Sakineh Mohammadi Ashtiani, but also others. In a country where hundreds are being executed every year at a rate second only to China, some extra ‘regular’ executions for adultery would not present a problem for those in power. On the other hand, since the Islamic Republic and its Supreme Leader are both unpredictable, we should not underestimate the possibility that the Supreme Leader would simply re-issue the same stoning fatwa, reverting everything back to square one. As a human rights activist, I suggest not rush to celebrate our victory, and continue our concerted efforts to stop stoning forever.